In January of this year it was widely believed 2014 would be a “stock-picker’s” market. While the S&P 500® index of large U.S. stocks produced an extremely generous return of more than 30% in 2013, an indexing strategy was deemed unlikely to be effective in 2014 — or so active managers argued in an attempt to justify their high fees. While several months remain we can still take a preliminary look at the results. While 2014 has been an especially difficult year for active managers, hedge fund performance has been equally disappointing. Hedge Fund Research Inc.’s indices of hedge fund returns (available at HFRDatabase.com) show that hedge funds have considerably under-performed the stock market throughout the period from 2009, when the recovery from the financial crisis began. Normally two-thirds of active managers under-perform the returns from a low-cost broad-based index fund. In the first half of 2014, about three quarters of active managers were under-performers. Another popular claim of the active-management community is that indexing will not work during a bear market. It is said “you can count on active managers to move into cash at exactly the right times” to protect investors during the inevitable periods of stress in financial markets. In fact, nobody has an ability to accurately time the market. The data show that mutual funds tend to have the smallest holdings of cash at market tops, and the highest proportion of cash in their portfolios at market bottoms. And even when some mutual funds correctly foresaw the collapse of the Internet bubble in 2000 they tended to move into cash, in some cases many years, in advance of the ultimate collapse of stock prices, thus negating any benefit from their ultimately correct call. Research by the Vanguard Group confirms that active managers continue to under-perform index funds during most bear markets. Some active managers will admit that indexing can be effective in the efficient sectors of the market, such as large-capitalization U.S. stocks. But they argue that indexing will not work in the less efficient sectors of the market, such as small-capitalization stocks and the equities traded in emerging markets. In fact, indexing works in all markets. During the past 10 years 84% of small-cap managers were outperformed by low-cost index funds that replicate the performance of small-company stocks and 71% of actively-managed market funds delivered inferior performance to emerging-market index funds. 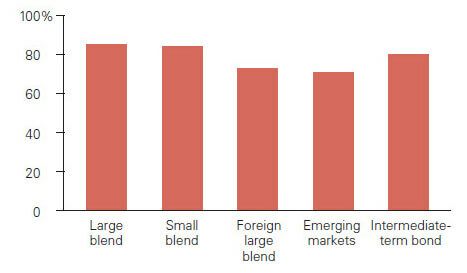 [ii] The very inefficiency of the trading markets for small-company and emerging-market stocks present a daunting challenge for active managers in these segments of the market. Bid-ask spreads and market impact costs tend to be large. Moreover the expense of following many small companies as well as emerging-market equities is high and therefore active managers in these segments of the market charge correspondingly higher management fees. …the variable that was the best predictor of future performance was the expense ratio of the fund. Low-cost funds consistently outperformed high-cost funds. [i] Christopher Phelps and Josh Hirt, “5 Myths and Misconceptions About Indexing,” Vanguard, June 10, 2014. [ii] Russel Kinnel “How Expense Ratios and Star Ratings Predict Success,” Morningstar Fund Investor, August 9, 2010. The S&P 500 (“Index”) is a product of S&P Dow Jones Indices LLC and/or its affiliates and has been licensed for use by Wealthfront. Copyright © 2015 by S&P Dow Jones Indices LLC, a subsidiary of the McGraw-Hill Companies, Inc., and/or its affiliates. An rights reserved. Redistribution, reproduction and/or photocopying in whole or in part are prohibited Index Data Services Attachment without written permission of S&P Dow Jones Indices LLC. For more information on any of S&P Dow Jones Indices LLC’s indices please visit www.spdji.com. S&P® is a registered trademark of Standard & Poor’s Financial Services LLC and Dow Jones® is a registered trademark of Dow Jones Trademark Holdings LLC. Neither S&P Dow Jones Indices LLC, Dow Jones Trademark Holdings LLC, their affiliates nor their third party licensors make any representation or warranty, express or implied, as to the ability of any index to accurately represent the asset class or market sector that it purports to represent and neither S&P Dow Jones Indices LLC, Dow Jones Trademark Holdings LLC, their affiliates nor their third party licensors shall have any liability for any errors, omissions, or interruptions of any index or the data included therein. Dr. Burton G. Malkiel, the Chemical Bank Chairman’s Professor of Economics, Emeritus, and Senior Economist at Princeton University, is Wealthfront's Chief Investment Officer. Dr. Malkiel is the author of the widely read investment book, A Random Walk Down Wall Street, which helped launch the low-cost investing revolution by encouraging institutional and individual investors to use index funds. Dr. Malkiel, also the author of The Elements of Investing, is one of the country’s leading investor advocates. Has Indexing Become Too Popular?